Backpacking Pillow: Luxury or Necessity? A backpacking pillow is often considered a non-essential among gear. While a pillow can add some weight to your pack and take up space, there are a lot of options available that can provide the comfort of a place to lay your head without too many negatives. Many backpackers choose to improvise and make their own pillow out of extra clothes from their pack through the use of a rolled up fleece or stuff sack. There are even specially made stuff sacks that are fairly lightweight and add a little extra comfort. This option can work really well. However, some people don’t prefer this method because they feel their head isn’t supported as well or they don’t like sleeping on clothes that have been used. Plus, depending on the time of year or terrain, you might not pack enough clothes to properly provide the comfort you’re looking for. If the above method isn’t for you and you would rather sacrifice some weight and space for more comfort, it’s time to seriously look at a pillow. Essentially, you will run into three different types of pillows: compressible, inflatable and a combination of the two. A compressible pillow for backpacking is filled with some sort of lightweight material such as down, foam or a synthetic material. They are made to compress into a very small size and then expand when you are ready to use them. 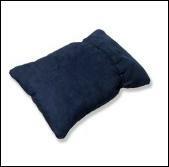 Typically, you can find this type of pillow that weighs less than half a pound. Inflatable pillows do exactly as their name suggests. When you are ready to use it, simply fill it with air and enjoy. After use, release the air and pack away. These pillows weigh less and take up less space than compressible pillows. You also have the ability to tailor the firmness to your liking. Which of these is the best is entirely subjective. Much of it depends on your needs and preferences. Personally, we prefer the compressible type, as we feel they are more comfortable.